Travel south 5km from the Shoalhaven River Bridge, turn left at McDonalds. North bound: follow the McDonalds signs to South Nowra, then turn right at McDonalds. All the sites and cabins are spaced and most of the sites are drive through. The cabins and villas are air conditioned and heated for your comfort. Within the park there are free covered barbecues and plenty of shaded areas for that cuppa or quiet drink with friends. The 2 bedroomed 4 star villa has a queen size bed in the first room and 4 bunk style beds in the second. 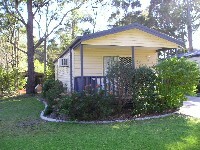 There is a fully equipped kitchen,TV/video and reverse cycle airconditioning. No cots available. Min of 2 nights and min 4 nights holiday period. The cabin has a double bed and provided with sheets & blankets, however bedding is required for the 2 single bunks. There are only basic cooking facilities available, hot plate and grill, microwave,fridge,tv and airconditioning.A min of 2 nights apply for long weekends and public holidays. Some powered sites are in a landscaped garden setting. BBQ are shaded, covered area, and a amenities block. No refund of acccomodation 2 days prior to the due date of reservation. 1 full day accommodation charged for all other cancellations.